Mitchell Starc will continue to ignore criticism from Shane Warne, saying he "may as well retire" if he listens to the former Australia star. Warne has again been unflattering in his assessment of Starc's bowling in recent weeks, writing in a newspaper column after the first Test against India that some of his play had been "atrocious". Those comments appeared to reignite a feud from 2015, when Warne criticised Starc's body language and the Australia man riposted that he had "nothing to prove" to the bowling great. Reports suggested Starc was unhappy with this analysis, but he says he is not putting much stock in Warne's opinions, insisting the focus will remain on beating India. 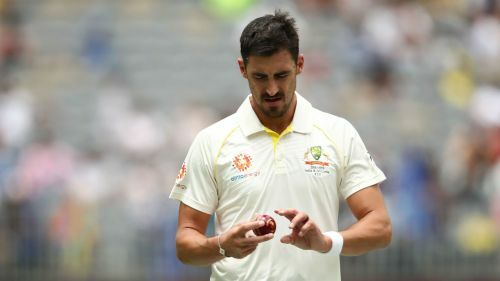 "I still don't know what he said," Starc told FOX after day three of the second Test on Sunday. "I've been told about it. "But if I keep listening to Warney, I may as well retire. I'll just keep going about my stuff, as I have done over the week." Australia led by 43 runs after the first innings in Perth, stretching that advantage to 175 as they reached stumps at 132-4 on Sunday. Starc (2-79) took the early wickets of Murali Vijay and Cheteshwar Pujara as India batted for the first time, before their recovery was halted by the controversial dismissal of captain Virat Kohli.